J.T. PARROTHEAD is a professional acoustic entertainer, providing a wide variety of music. 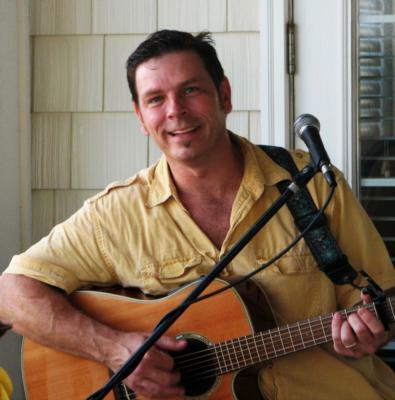 He specializes in JIMMY BUFFETT tunes, having played "Margaritaville" themed parties from south Florida to Chicago, but covers many genres of music at venues of every size. If you're a fan of the "singer-songwriter" era, J.T. performs many of those unforgettable tunes that can "take you back in time" and re-live those special moments in your life. J.T. is the #1 most requested professional singer/musician in the Raleigh/Durham area over the past THREE years on GIGMASTERS, the TOP search engine musician finder in the U.S.! A Finalist in last years WAKE WEEKLY'S "BEST OF THE BEST", J.T. was the TOP VOTE GETTER for solo musicians! A professional songwriter and musician, he enjoyed 6 years in Nashville, with his originals surfacing in Canada and Australia. J.T. also has a vast country music background, as many venues in the south demand. His songlist ranges from Johnny Cash to AC/DC. Now, here's the "biggie"! J.T. refuses to doctor his authentic sound by using "looping or drum machines"! If "REAL" LIVE ACOUSTIC MUSIC is what you like...look no more. One guy...one guitar...one GOOD time! JT was amazing to work with! He was amazingly considerate of my tight budget. He arrived on time & was so awesome in helping decide the best place for him to setup ( we had to move from back yard to front & garage due to rain). Our RSVP list dropped by about 30 people due to my husband is an ED RN & a lot of his friends from work couldn't make it due to short staffed at the hospital & sickness. JT played like they were all here. Everyone commented on how great he was & wanted his contact info! Will definately have him again even if I have to make up a party just to hear him! Thank you so much JT! You made Dave's surprise 40th party awesome!! Excellent performer. Our customers loved him. Many requests for him to return. Very professional and a pleasure to do business with. JT was awesome! We loved him and his music. He played everything we asked (both advance playlist and on the spot requests) and the sound was great. He knew just want to sing and when, there was never a volume level issue nor poor song selection. We will be booking him for future events both corporate and private parties. I can't say enough good things his performance and professionalism. He is the type guy that you talk to him for 2 minutes and you feel like you have known him forever. He interacted well with staff at all levels (executies down to entry level staff). Book him for your next event and you won't be disappointed!!! JT was a fantastic addition to our party. He played well-known songs out on our patio for a low-key summer cookout party for approx. 40 people or so. By the end of the night we had people outside dancing and everyone was singing along. He is a talented singer and a joy to work with. We look forward to having him play at a party this fall for us we hope!!! JT added the perfect touch to my husbands 50th birthday party with his easy manner and fun playlist! He played crowd favorites and took audience requests as well. He was extremely professional,talented and fun to have at our party. The fact that several of my guests requested his business cards during the party says it all! We will definetly call on JT Parrothead for future events & plan to catch him locally at Shuckers when he appears there. JT was fantastic! His music was perfect for our event and he was extremely nice and accommodating. If we ever need someone for another occasion, JT will DEFINITELY be our first choice! JT is awesome! He was extremely accomodating considering many of the last minute changes made in regard to our reception. 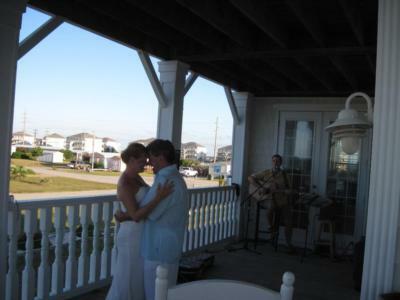 He learned a new song for our "wedding first dance" and it was beautiful! All our guests commented on how great he sounded. JT is very professional besides being extremely talented. We definitely, highly recommend him & are so pleased we discovered him on Gigmasters! Please note JT Parrothead will also travel to Butner, Stem, Durham, Bahama, Franklinton, Raleigh, Oxford, Wake Forest, Youngsville, Kittrell, Bullock, Rolesville, Timberlake, Rougemont, Henderson, Louisburg, Cary, Hillsborough, Hurdle Mills, Middleburg, Morrisville, Stovall, Chapel Hill, Knightdale, Roxboro, Carrboro, Zebulon, Cedar Grove, Wendell, Bunn.